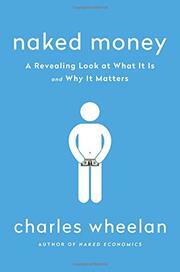 An economist and bestselling author examines the nature, utility, and power of money. Say this for Wheelan (Public Policy/Dartmouth Coll. ; Naked Statistics: Stripping the Dread from the Data, 2013, etc. ): he knows how to conduct a class. Well before tackling difficult topics—why Japan tolerated two decades of deflation, why the United States and China are in an “unhealthy codependency,” why the structural infirmities of the euro were baked in, why the gold standard is the key to understanding the Great Depression—he’s careful to lay the groundwork, introducing and defining terms and offering a potted history of the financial crises that have plagued American capitalism. Before exploring the mysteries of bitcoin or explaining the challenge of modern monetary policy, Wheelan has already managed to keep his students interested and on task with his consistently good humor and lively use of real-world references: he spotlights the proliferation of frequent flier miles to explain inflation, uses a list of Hollywood’s highest-grossing movies to mark the distinction between “nominal” and “real” figures, cites the cost of a Big Mac to measure market basket prices among nations, explains how pouches of dried mackerel qualify as currency in prison, and invokes It’s a Wonderful Life to illustrate a financial panic. Still, the author keeps to his serious purpose, making clear, for example, the difference between liquidity and solvency, the power of credit, the nature of exchange rates, the necessity (and danger) of fiat money to a modern economy, and the importance of banks and of central banking in particular. Specialists will find little new or original here—although they may well be interested in the high marks Wheelan gives Ben Bernanke for navigating the 2008 crisis—but general readers will welcome this wonderfully down-to-earth treatment of a subject too often the exclusive province of experts.